Easy Banana Bread Recipe. Made with bananas, butter, evaporated milk and pecans. As holidays approach, we think about good old fashioned recipes our grandmothers and mothers used to make, such as this delicious bread. 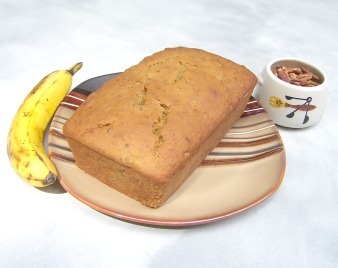 Banana Nut Bread is so easy to make it deserves to grace our family table all year. This recipe and mixing method produces a bread that is not dense and is sweet enough to eat alone as a dessert or a snack. Prepare loaf baking pan (I use 9 1/4" x 5 1/4" x 2 2/4" size). Grease bottom and sides with butter. Place piece of parchment paper cut to fit in the bottom of pan. Grease it. Then sprinkle bottom and sides lightly with flour. Sift together sifted flour, baking powder, baking soda and salt. Set aside. Cream butter on high speed. Reduce to low speed and add sugar, a little at a time. Turn back to high speed and cream until light and fluffy. Add eggs, one at a time, creaming on high speed after each addition. Scrape down sides and bottom of mixer and cream one more minute. Stir in vanilla extract and butter, vanilla and nut flavorings. Turn mixer to medium speed. Peel one banana at a time and add it to the mixture. Beat it until it is smashed and add the next one. (Takes about half a minute per banana). Remove mixing bowl from mixer and lightly fold in flour and evaporated milk, a little at a time by hand, starting and ending with the flour. You want to mix it all thoroughly, without over-beating. Fold in pecans. Spoon batter into the prepared loaf pan. Smooth top with the spoon. Bake in a preheated oven 350F., 70-80 minutes or until browned and tests done, by sticking a toothpick into the center. Remove from oven. Let rest 10 minutes and turn out of pan onto a cooling rack or serving platter. Slice as needed. Serve warm or cold. To store, cover bread. It is moister the next day. Grill slices on both sides on a griddle or in a heavy skillet. Serve with butter. Spread apple jelly or apple butter on toasted or grilled slices. Slice and spread with butter. Toast under a broiler until browned to your preference. Spread slices with cream cheese and heat in microwave 10-12 seconds. Spread one side generously with crunchy peanut butter. Heat both sides in microwave 10-12 seconds and sandwich. Spread peanut butter (and banana slices, if desired) between 2 cold slices for a delicious sandwich. For a heavenly dessert, heat a slice of the bread in the microwave. Top with a scoop or two of your favorite ice cream or yogurt. Top ice cream with whipped cream and sprinkle on additional fruits, if you prefer. I like to use raspberry yogurt, then banana slices and top whipped cream for a decadent treat. Yummy. A favorite way to serve is to arrange cold slices of this bread on a serving tray along with slices of sharp or extra sharp cheddar cheese and cold Gherkin pickles. And of course serve the wine. This Easy Banana Bread Recipe makes a great gift. Wrap it in festive cellophane paper and tie on a pretty bow. Wrap it in paper and add it to a gift basket for someone special. Include a card with the serving suggestions listed and some of your own ideas.